Discussion in 'Mineplex Guides' started by Cheezeburgerfan, Oct 14, 2018. This list includes all staff members with the "Bedrock" tag on website (and some people who are Bedrock staff but do not have the Bedrock tag). Admins, Leadership Team, and Owners have been excluded from the list since they manage both Java and Bedrock servers as a whole, and are by definition "Bedrock staff members". Although this staff list is unofficial, it is accurate. I will try to update this list as often as possible. Feel free to tell me if i missed anyone, or if there are any staff members on this list that are not actually Bedrock staff members! FabianTuck, Evence, BaconAnEggs and 12 others like this. Thanks for making this thread! I find it very useful! You can also find this information on mineplx.com/staff, but this is much more organized and easy to read! Have a good one! Good job on the thread! I actually really like this thread due to how the current Staff page doesn't really separate the Java and Bedrock staff members so you can't really tell what staff member is on which edition, it's nice to see all of the Bedrock staff separated from the rest of the staff on Java. Overall, this is a great thread and I hope to see it updated in the future for more staff to come! Combativeness/xWorpp and GuardianInASuit like this. You forgot gyroninja, who is a bedrock developer but also hasn't registered on the website. I wanted to do that but i couldn't figure out how to. Do you know how? 1) Get the staff member's URL by going onto https://www.mineplex.com/staff and viewing their profile. 2) Write out the Staff member's name on this thread (as you have already done) and then highlight it. 3) Click the link button (https://imgur.com/0Pf2j3d). 4) Paste in the Staff member's URL and click 'insert'. 5) The name should now appear blue and is now clickable, once clicked it should be linked to their appropriate profile. See how that works out! If you need any more help/answers in a more detailed way feel free to PM me! Cheezeburgerfan and IHackedJake like this. Thanks for helping me! It worked! Really good idea due to the fact that if a player needs to get a hold of a Bedrock staff member, they can do so without having to really search through the staff list to find the tag. It's also immediate contact pertaining to the position the staff member has. I find this thread to be very helpful. Thanks! I know that this guide is going to be really helpful for the bedrock community as having all of the Bedrock staff listed in one place is something that the Staff list doesn't have. I like that It's a simple list which is easy to look through - which makes it very easy to find what you're looking for. I can tell you've spent time on this and having all the profiles linked is super helpful. It's also very accurate so good job with that! Yeah, i don't like bedrock much either, but i figured i'd make a staff list for it since it would be very useful for a lot of people. Hey! Nice guide! 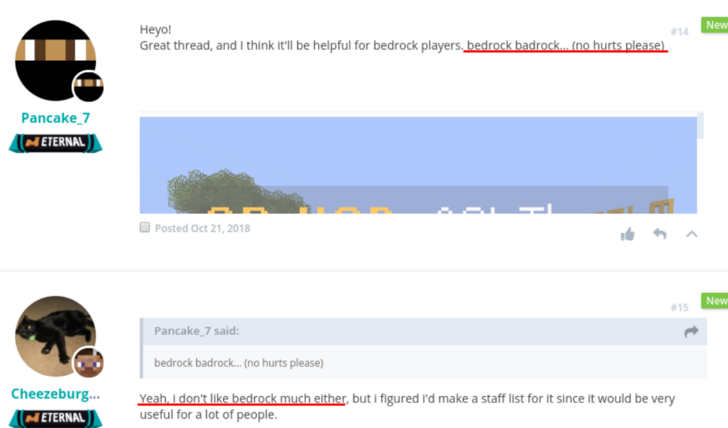 This should help players find the right staff members when they need help with Bedrock related issues! As a suggestion, what about adding what moderator subteams the staff are in below so players can see who to message for what issue, such as bedrock MA/RA etc. All in all, nice informative guide! Thanks for making it!! As a suggestion, what about adding what moderator subteams the staff are in below so players can see who to message for what issue, such as bedrock MA/RA etc. All in all, nice informative guide! Thanks for making it!! Players are more likely to contact the appropriate sr.mod teams if they need help on that issue. I don't see how adding subteams will help. Also no offense, but if a player were looking for a bedrock staff member, I don't think they'd be able to find this thread or look at it. Again, they're more likely to ask a staff member. As of 11/24/18, SoulHardy is now a Moderator! Please update. Cheezeburgerfan and soulhardy like this.